Kuwait's court of appeal has reduced to three months a one-year jail term given to a prominent journalist for slandering the prime minister. Mohammed Abdulqader al-Jassem wrote an article that was said to have accused Sheikh Nasser Mohamad al-Ahmad al-Sabah of collaborating with Iranian intelligence. 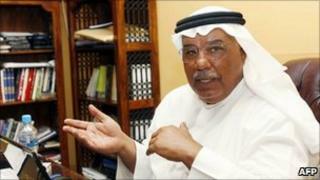 Al-Jassem denied that his article had implicated the prime minister. Human rights groups say the case is an attack on freedom of expression. Al-Jassem's lawyer, Abdullah al-Ahmad, told French news agency Agence France-Presse (AFP) that he would remain in jail "at least for the time being". The article - posted on Al-Jassem's website - also called for the prime minister to step down, saying he could no longer run the oil-rich Gulf state. In April, a court sentenced al-Jassem to six months in jail for slandering the prime minister at a public rally, but the appeals court overturned the ruling three months later.